Carters continues to stand by their position that babies' reactions to their tagless clothing is "rare" and "isolated" thus not warranting a company recall of their merchandise. However, these pictures speak a thousand words and break our hearts. Carters, isn't ONE baby's injury enough to start this recall? We have received numerous emails from parents nationwide as well as other countries sharing their own horrible experience with their babies wearing these Carters tagless clothes. Enough is enough! Recall this merchandise and save other families and their babies from enduring this preventable injury. 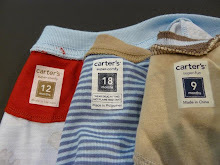 Carters often references their safety investigation of their tagless labels. I am curious though, why haven't they ever contacted us about Ava's case? It seems logical that their investigation would benefit from the data of a case such as Ava's. Carters investigative team has never asked us about Ava. We would be happy to share the data. Carters would see that Ava was diagnosed with a chemical burn from a medical expert. They would see that Ava chronically suffered. Who knows, they might even find an answer to this hazard by looking at her case. We are not part of the lawsuit, we only want answers and we only want full disclosure and appropriate actions. We made the effort of writing the Executive staff of Carters and only received responses to placate our frustration, not a response of action. The CEO interview in ZRecs just further exasperates us for these reasons: They are sticking to boilerplate responses, falling back on statistical quality thresholds based on fallable data, and they continue to ignore the fact that babies are suffering from their products. We will continue our quest to compel Carters to do the right thing. Being on the record, Casey surprisingly provides more information and color into what went into the creation of these tagless labels and their corporate stance on the whole situation. We are so relieved this story and all of our experiences are finally getting the coverage it requires. Carters, we hope you are watching; these were once your consumers whose trust you had, but whose babies you have injured. We look forward to the days and months to come as Lindsey Webb, the CA class action plaintiff, the other parent-plaintiffs nationwide and their legal team push their class action ahead...how will Carters respond? Can they really continue to keep their heads in the sand and stand by their corporate position that a recall is not necessary? Carters must now respond through the legal system. The class plaintiff in CA, Lindsey Webb, and her attorneys from Emerson Poynter, Whatley Drake & Kallas, Thomas Butler and Robert Jigarjian filed this Class Action Complaint on November 6, 2008. We are pleased with the complaint's allegations and requested relief for plaintiffs. Please read on. "Children are more susceptible to chemical toxicity than adults" and "infants have a relatively greater surface area of skin than adults, thereby increasing their potential dermal absorption of certain compounds." "This higher rate of intake means that children will receive higher doses of whatever contaminants are present..."
"The thin skin of a newborn may well be more permeable to specific chemicals than the skin of an adult. Compounding this fact, the surface area of a child's skin relative to body weight is greater than adults, such that the potential dose of a chemical following dermal exposure is likely to be about 3 times greater than infants than adults." They are demanding a jury trial. Finally, some of the relief they are requesting is a certification of the class of plaintiffs, judgment to "restore, by way of restitution, refund, or reimbursement, to any person in interest any money paid to and/or acquired by Carters" and "an Order directing Carters to immediately take all reasonable steps to ensure the defective clothing is removed from the stream of commerce...."
Thank you to this plaintiff and her team for taking this legal stance and demanding Carters finally do the "right thing" for everyone involved. We appreciate everyone's support and collectively, we hope all of us can bring more media attention and public awareness to the hazards of these tagless clothes. Where the media stories and our demand for a formal recall remain ignored, some parents are seeking redress through legal resources. Perhaps that is what is necessary for Carters to own up and stand behind their corporate promise to "make trusted" clothes for our kids. At this point, our trust is irrevocably shattered. Just today, a victim told us she asked a Carters store manager if she knew about the tagless safety issue and yesterday's advisory and statements from CPSC and Carters. The manager of Carters retail store had no idea! Carters: you have a duty to effectively communicate to your distributors and especially your own stores. You can not stop with this advisory. Communicate effectively and comprehensively, be compassionate and fair with your victims, and recall your products. Our Baby's Chemical Burn. Pediatrician Photo. Why did I start this dia(blog)? 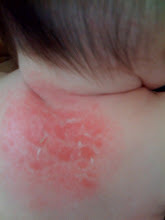 Since my daughter, Ava, was 6 weeks old, we started noticing redness on her back (around her neck and between her shoulders). 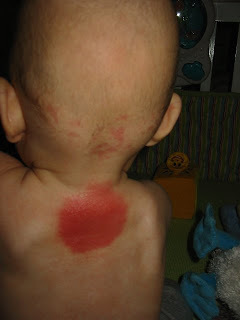 Instead of enjoying these first couple months of our baby's arrival into our lives, we began a nightmare into what was causing this growing wound on her back. We spent many days and nights comforting her, going to the doctors' appointments, the emergency room, after-hours medical appointments, using many methods and medications to try and soothe her pain. At barely 3 months old, Ava's wound was the worse we'd ever seen it. She could not sleep on her back and was not yet rolling over. We had to hold her to give her the comfort of rest. At this pediatrician's appointment, they looked at her and said they'd never seen something so big! It was terrifying. The doctors told us to immediately go to the hospital, because the wound was so big it might be infected (we discovered through the cultures taken at the hospital that Ava caught a staph infection!) and our daughter might not be able to fight it on her own. We rushed to UCSF Children's Hospital where Ava was put in a sterile hospital room (anyone entering had to wear gloves, a mask & gown). She was given IV antibiotics and monitored. I spent the night with her, but didn't sleep at all. What parent could? I rattled my mind wondering what this was, how it happened and if my daughter would be okay. Even after she was released from the hospital, she still had this painful chronic back wound. We cut the area of her clothing that covered this pear-shape wound to apply the topical treatments and closely monitor her recovery. 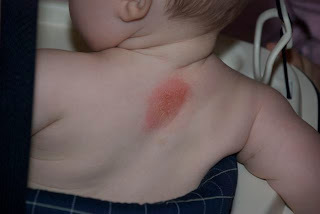 We continued to go to her Dr.'s appointments and they still could not figure out why she had this chronic back wound. Last month (September 2008), I was perusing through the Internet and discovered several blogs on babies being affected by Carters tagless clothing. This ah-ha! moment brought to light the months of unanswered questions to my daughter's wound -- it was the Carters tagless clothes she wore that caused it. We immediately removed all Carters clothes and switched to the old type of labeled baby clothes. Her back wound is healing. She is now almost 7 months old. We have spoken to Carters, the media, and to many parents whose babies have been affected. It is my hope and intention that this becomes a more public dialogue where Carters and any other baby manufacturer and/or distributor that becomes aware their products are causing injury or harm to babies/children and their families inform the public, and immediately recall and remove these products!